Florida’s net metering policies are praised and deemed worthy of protection by the overwhelming majority of interviewees. Assessments diverge when it comes to the current lack of (virtual or) aggregate metering, which is seen by practitioners as a cornerstone of community solar projects. One utility representative refers to Florida having already “some of the most generous net metering rates in the nation,” not requiring any further “corporate welfare” to solar companies. The majority of the interviewees vehemently challenge this assessment, which is also not further substantiated. Solar advocates single out community-owned solar projects as a great way to leverage economies of scale and reduce fixed costs, but lament that under current regulations, rather than receiving metering credits at the retail rate, shared community solar arrays would be metered at the wholesale electricity rate rather than at the retail rate. Wholesale electricity rates of 3-4 cents/kWh make these projects financially unviable. Solar companies further attach greater weight to the fact that non-IOUs are not mandated to offer net metering. Working across multiple utility company jurisdictions particularly relating to net metering involves excessive marketing and administrative hurdles. Florida Public Service Commission (FPSC) approvals of utility base rate increases are a thorn in the side of solar advocates, who see the net present value of solar systems decrease. Selected utilities, however, call into question how the depreciation of infrastructure enhancements and other capital costs can be financed in any other reliable way than through factoring these costs into the base rate. However, the validity of this argument is heavily disputed among the interviewees. The absence of a renewable portfolio standard in Florida (with or without specific solar carve-outs) is brought up most frequently as a high-impact barrier. Even within the utility-camp the failure of the Florida Legislature to move ahead with the FPSC proposal for a RPS is bemoaned for its failure to secure a financing stream for utility-scale solar projects. 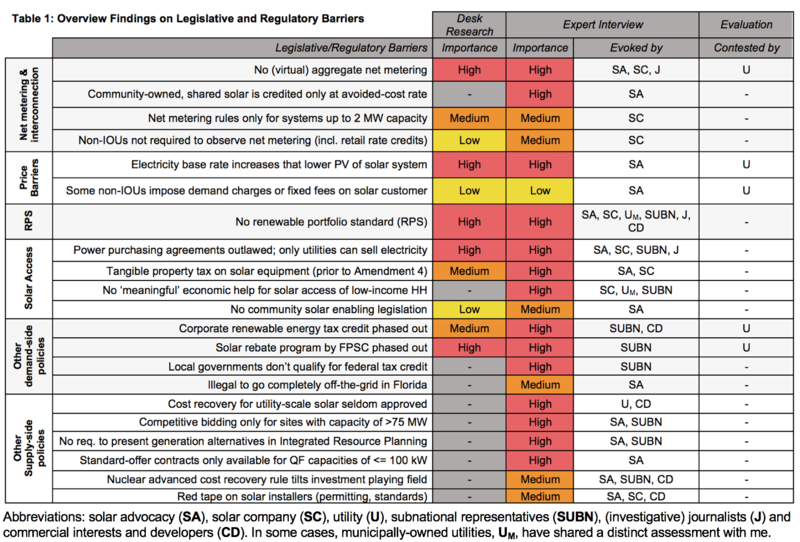 In terms of solar access, the illegality of power purchase agreements (PPAs) is generally regarded as the second most important barrier to solar in the Florida after the absence of an RPS. Even though multiple solar advocates and solar companies redouble their efforts to provide “smart” leasing options as second-best options. With tailwind from Amendment 4, which decided on the elimination of the tangible property tax component on solar equipment, leasing options are generally assumed to be filling the void that PPAs have left. 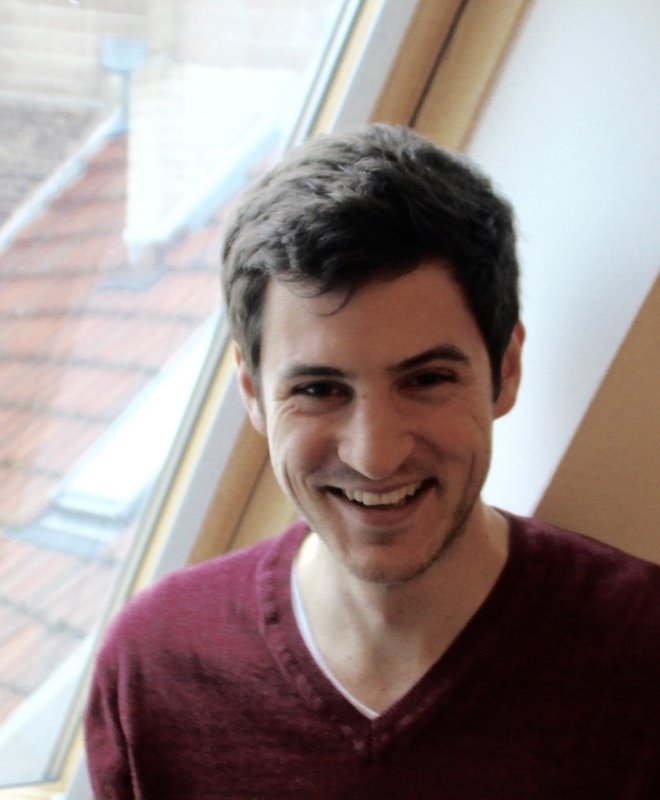 City and county officials are particularly sensitive to an issue that has the potential to feed into the utility’s narrative of solar being only for ‘the rich’ and further drive a wedge in between constituencies: the lack of meaningful economic assistance for low and medium-income households in order to facilitate solar adoption. Utility representatives and affiliated groups are adamant that the (now phased out) corporate renewable energy tax credit and the state-wide mandated solar rebate program were imperiling their mandate to provide “cheap and reliable” power to all ratepayers by adding additional costs. The most cost-effective source of energy they maintain comes primarily from natural gas. Commercial entities and developers recognize that some of their planned solar projects have since become financially unviable. City and county officials are confronted with an additional hurdle, since as a government entity they do not qualify for the 30% tax credit. Bulk discounts and special government rates mitigate this disadvantage to some extent, but the higher price of solar is a strong inhibitor for already cash-strapped communities. Finally, even though current battery systems may not be advanced enough to make this option possible for many, but living completely off the grid in Florida, as one solar advocate remarks, is interpreted by Florida’s courts to be in violation of property code. If a dwelling remains unconnected to the electricity grid and relies solely on solar for instance, building permits can be stripped away. On the supply-side of solar, utilities and commercial entities and developers both highlight that the FPSC is reluctant to approve utility petitions for cost recovery of capital costs if the new generation is found not to be the most cost-effective way of generating. In the past, utility-scale solar was found not to be the most cost-effective generation, limiting the scope of IOUs to pass through project costs onto their ratepayers. In its Ten-Year Plan FPL notes that due to the cost decline of PV modules, utility-scale PV is now cost competitive in certain regions, which makes it harder for utilities to obtain all their rate-increase requests to recoup non-solar capital cost. Secondly, solar advocates such as the Southern Alliance for Clean Energy highlight a statutory provision that exempts electric power plant projects, which includes large-scale solar, of less than 75 MW from a competitive solicitation process. Florida Power and Light for instance repeatedly uses this provision to its advantage and in 2016 built three solar energy centers of 74.5 MW each. According to solar advocates, this insulation from competition significantly constrains utility-scale solar from reaching its full potential. Furthermore, they point out that utilities under the oversight of the FPSC are not required to present a comprehensive overview of alternative generation options during the public hearings of their long-term portfolio planning. They further echo their public position that in the Request for Proposal, RFP, process of the FPSC utilities only need to present evidence that any planned generation outperforms the “price and non-price attributes of the next planned generating unit” – which FPL restricts to capacity that is “fully dispatchable and under the operational control” of the utility. These restrictions, solar advocates argue, make it pretty much impossible for utility-scale PV to emerge as the winner in the internal benchmarking of the utilities. Fourthly, solar advocates criticize that the FPSC effectively shelters utilities from paying significantly more third-party renewable generation facilities, which are called qualifying facilities, in case their generation (sold at avoided-cost to the utility) can substitute for the utility’s capacity investments. Currently, only qualifying facilities of up to 100 kWh are eligible for the standard contracts under Public Utility Regulatory Policies Act, which contain the capacity payment provision. If the eligibility threshold were raised, this would represent a considerable stimulus to the deployment of solar through qualifying facilities. Fifthly, the nuclear advanced cost recovery rule, which makes the deployment of nuclear facilities more attractive is cited repeatedly as a feature of the uneven playing field solar competes in. Though, the high overall cost of nuclear reactors, significant public pushback are cited as mitigating factors (in May 2017, a Senate bill intent on repealing the rule was withdrawn from consideration). Lastly, solar companies and commercial entities and developers are vocal about the administrative burdens that compliance for instance with two equipment standards imposes on them. Also, they suggest that implementing a streamlined permitting process for systems under 25 kW as part of the Florida Building code for residential solar would – in one interviewee’s calculation – would save between USD 800-1,000 per solar installation that could make residential solar a much more attractive investment. Check back at the end of the week for Part 3 of the series, which will showcase county and city-level initiatives to increase solar PV deployment despite the state level policy constraints.